The Dorothy table loom is an excellent choice for all weavers from the beginner to the most experienced multishaft designer. Its ability to fold makes it perfect for workshops or home use and those with floor looms will find it a wonderful loom for testing samples. The loom is available in either 15 3/4 (shown at left) or 24 inch (shown at right) weaving widths and can be ordered in 4, 8 or 12 shaft configurations. Side mounted levers are colour coded and set at different lengths to allow the weaver to "feel" the right lever. Depressing one or more levers will automatically release the previous lever selection in each set of 4 shafts. The cloth beam of the loom has a ratchet mechanism and the warp beam provides tension through a friction brake controlled by a lever and spring at the front of the right side. Both beams have a hand crank with a wooden handle that is easy to turn. An optional second warp beam can be ordered for the loom. The Dorothy loom can be ordered in 4 shaft, 8 shaft or 12 shaft configurations and a 4/8/12 shaft loom can be easily expanded at some point in the future when more complex weaving support is required. The loom is constructed using 1, 2, 3 or 4 independent "shaft boxes", each having 4 shafts which are installed using 4 screws. These shaft boxes can be added or removed to change the overall number of shafts (see picture at left). Upon special request, the levers for these boxes can be mounted on the left side or alternated with the first set on the right, the second set on the left, etc. 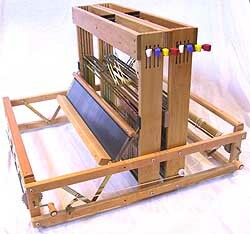 This unique design allows for easy loom upgrades and makes the Dorothy a perfect classroom loom by allowing an instructor to temporarily create an 8 or 12 shaft loom by borrowing shaft boxes from one or two other 4 shaft Dorothys. The Dorothy 4 shaft loom folds down flat to a compact size for transport and storage simply by unscrewing two wing nuts. This can be done when the loom is warped (see picture at right) making it easy to take your weaving project "on the road". For 8 and 12 shaft versions, the shaft boxes can be removed (while un-warped) for storage or shipping. Options available for this loom include the ability to have the loom configured with Inserted Eye Heddles instead of Wire Heddles, a second warp beam along with mounting bracket and a sectional warping beam with 1" spacing (24" Dorothy only). These options are all priced below. While the Dorothy is designed for use as a table loom, a special table is available for the 15 3/4" version to allow it to stand on the floor. This optional Loom Table folds flat for storage and holds the loom at a height of 25" to allow the weaver to use an ordinary chair. The table design includes a handy space on each side of the loom to put shuttles, bobbins and other weaving tools. The table is shown to the left. For the 24" Dorothy, the loom can be bolted to an optional stand assembly that can optionally include foot treadles to converting this table loom into a floor loom. The Treadle Stand supports 4 shaft looms with 6 treadles and the regular Loom Stand without treadles supports all versions of the 24" loom. The stand attaches easily and has two handy side starage shelves. The 4 shaft treadle stand has a set of cords that connect to the loom levers. Both stands can be easily adjusted to match the weaver height. The following chart shows the differences between each of the Dorothy models. Description Dorothy 15 3/4" Dorothy 24"
Looms are shipped partially disassembled for easier handling and to avoid damage during transit. Assembly is simple with written instructions included as well as the required tools. When ordering a 15 1/2" 4 shaft Dorothy, a special long frame option (see below) must be ordered if the loom is to be later upgraded to 8 or 12 shafts. These options can be added to your order to expand the functionality of your loom or can be added to an existing Dorothy loom (except for inserted eye heddles which must be purchased separately for existing looms).